Last week, I announced that I was creating a player corporation. It didn't take long before enemies of the New Order realized that this presented them with an opportunity to wardec me. ...By which I mean, of course, an opportunity for them to ask other people to wardec me. ...Or to make empty threats about wardeccing me in the future. ...Or to make empty threats about hiring others to wardec me in the future. 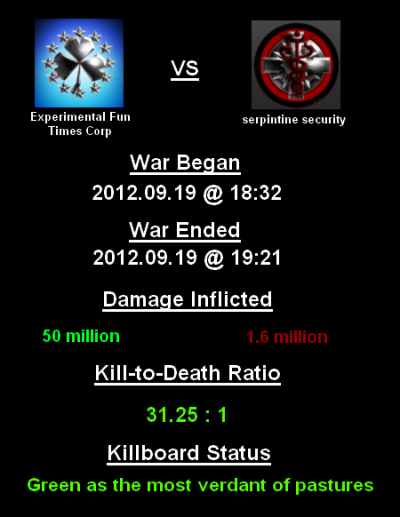 Finally, Experimental Fun Times Corp received its first wardec. The offending corporation, serpintine security, belongs to one brichardi. You might recall some weeks earlier brichardi attempted to engage me in a 1v1 duel, but after she invoked the Test of Wisdom, she failed (on the Amazon River question). After spending 50 million isk to declare war, brichardi began smack-talking in local. After war is declared, there is a 24-hour period before fighting may legally begin. I took a few minutes to educate brichardi about the dangers of wardeccing the Saviour of Highsec, but to no avail. She also refused my offer of accepting her surrender. I had no choice but to teach brichardi a lesson by winning the war. I returned to station to launch "Operation Green Killboard". 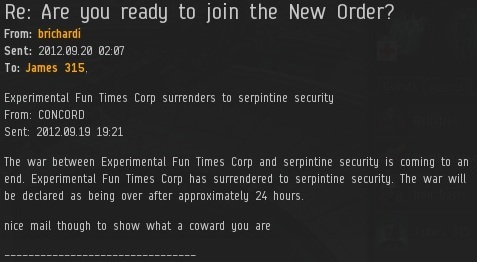 Within moments, and for a price of just under 1.6 million isk, Experimental Fun Times Corp dissolved and immediately rose like a phoenix from its ashes. Everything was the same, except there was no more wardec. 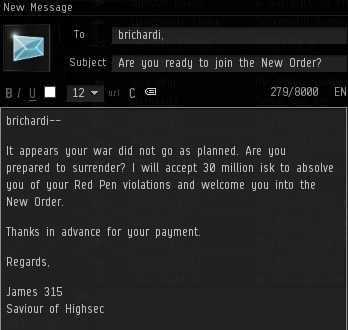 With the war having been concluded, I again offered brichardi the chance to surrender. "Corp hopping: This is never an exploit with one exception; you are not allowed to join a corporation that is at war while you are in space and in the same system as a war target of that corporation." "....Not an exploit. Dis banding and reforming a corp takes quite a bit of effort (if it is not a lot of effort then I suggest you wardec corporations that are worth it)." Thus, brichardi spent 50 million isk on a wardec that was reversed by a 1.6 million isk corp reformation. Wars against corps used to cost 2 million isk, but again, highsec miners complained about wardecs making highsec less safe, and CCP accommodated them. Just as with Concord protection in the highsec ice fields, the New Order has turned the carebears' own weapons against them! May the New Order continue to march from victory to victory! I was wondering where you were going with leaving the NPC corp. It was better than imagined. Congratulations on your victory!!! I'd even bet our Saviour has received donations for the war effort. Well played sir, congratulations on your first astounding victory against the heretics! Grasshopper always wrong in argument with chicken. "The supreme art of war is to subdue the enemy without fighting." Knew James 315 was a coward and this proves it!!! I'd love to know how you twisted your logic into enough of a pretzel to arrive at that conclusion. It is admirable for the Supreme Protector to show miners both sides of hisec mechanics. Judging by my experience with wardeccing miner corps in the past, they're already quite familiar with the wardec-evasion mechanics. You are an inspiration to everyone who would set out to actually achieve something and I am sure the results of the Alliance Tournament will show everyone the fruit your methods and teaching are capable of bearing. 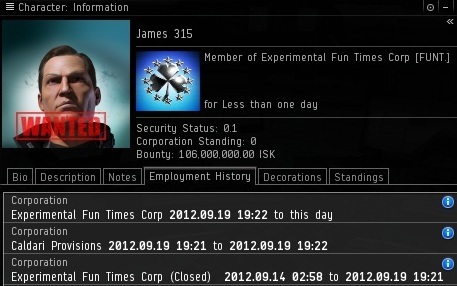 Don't sell yourself short James, your k:d ratio is a magnificent lots:0, it's your efficiency that's at 31.25:1 (or 96.8%, a figure that would surely earn Experimental Fun Times Corp the top position on eve-kill.net!). That's a good point, technically it's efficiency. But given the familiarity most readers have with the KDR term, that's what I've been using--at least in the context of Experimental Fun Times Corp. Note: If you are unable to post a comment, try enabling the "allow third-party cookies" option on your browser. How Much Authority Do Agents Have?